Farmscan is pleased to announce the release of the debut wireless blockage monitor from Intelligent Agricultural Solutions (IAS). The latest product from IAS uses acoustic sensors to detect blockages at any location within air seeding implements. The sensors use a patent-pending method to “listen” to the flow of seed and fertilizer as it bounces off a stainless steel membrane similar to a stethoscope. Sound pulses are then converted into digital signals and transmitted wirelessly to an iPad mounted in the cab of the tractor. IAS’s iPad app then displays a graphical representation of the system, instantly alerting the operator to any blocked run. This wireless system significantly reduces the use of wires, producing a more robust and reliable system. The Wireless Blockage Monitor is superior to existing monitoring systems due to its ability to detect blockages anywhere in the seeder. Many traditional systems rely on optical sensors that are unable to detect a blockage until seed has collected in front of the sensor minutes after the initial blockage has occurred. Optical sensors are also extremely susceptible to being coated in dust or fertilizer residue which dramatically reduces their efficiency. Farmscan believe one of the greatest benefits of IAS’s wireless system is the use of the iPad which provides customers with a flexible platform that can be used both at work and at home. With the Wireless Blockage Monitor, operators can not only watch their seeder, they can also use the iPad for other applications like checking commodity prices, weather and keeping in touch with family and friends. 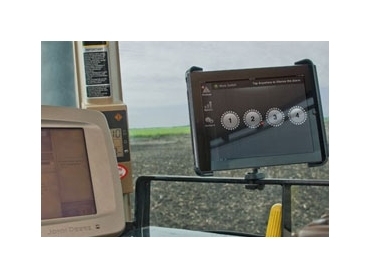 As IAS continue to develop software applications for the iPad, farmers will have a truly versatile, multi-use platform for a fraction of the price of current ag-specific displays. The Wireless Blockage Monitor has been designed to be installed on large range of air seeders models, new and old, and will be available to purchase from Farmscan AG this fall.